Fayetteville, NC – Saint Augustine’s, kind of, shocked the sports world when they defeated defending CIAA Champs Winston-Salem State last weekend to claim the CIAA Southern Division lead. The Falcons attempted to repeat another shocker, but the Broncos of Fayetteville State was not having it; winning its homecoming game 34-31 and taking the divisional leaderboard with a 3-2 conference record and 3-0 Southern Division record. The Broncos are 4-4 overall. Saint Augustine’s (3-5 overall, 3-2 CIAA, and 2-1 Division) won the coin toss and put up seven points on its first possession. From that moment, the Broncos quickly put up 28 unanswered points for a 21-7 halftime lead and a 28-7 lead with 14:46 left in the third quarter. The Falcons managed a score late in the 3rd quarter (28-14) but David Lamb (Pineville, NC) nailed a 25-yard field goal to set the game at 31-14. Riddled with 11 penalties for 97 yards, a Broncos’ personal foul gave St. Augustine’s good positioning, which the Falcons later cut the FSU lead down to 31-21. On the pursuing possession, Fayetteville State was pinned back in its end zone and turned the ball over on downs on its 46-yard line. SAU then kicked a 29-yard field goal to trail 24-31 with 6:14 left in the game. A thrown interception by Fayetteville State gave Saint Augustine’s another fighting chance with 4:37 left. In three plays, SAU was back in the end zone as the game stood tied at 31-31 at the 3:27 mark. Stevie Green (Washington, NC) carried the Broncos as the leading rusher in the game with 176 yards and two touchdowns. He also finished with two receptions for 32 yards. The Falcons sacked the Broncos on its first two possessions, which had FSU facing 3rd down and 26 yards for a first. On a risky hand-off on the FSU four-yard line, Green scurried 26 yards for a Bronco first down. Richard Latimer (Charlotte, NC) would then connect with Curtis Burston, III (Brooklyn, NY) twice for a combined 24 yards. A 14-yard rush by Green and ten (10) yards by Donshel Jetton (Mooresville, NC) set Fayetteville State up for one last play with six seconds left and the ball on the Saint Augustine’s six-yard line. In comes place-kicker David Lamb, who had the same setup in the Broncos 24-21 win over Shaw. Once again, the homecoming stadium erupted with the 23-yard game winner. Donshel Jetton finished the game with 81 yards on 12 carries and one touchdown. Richard Latimer threw for 208 yards on 14-of-23 attempts with one INT. He also rushed for one touchdown. David Lamb was two-for-two in field goals and four-for-four in point-after-kicks. 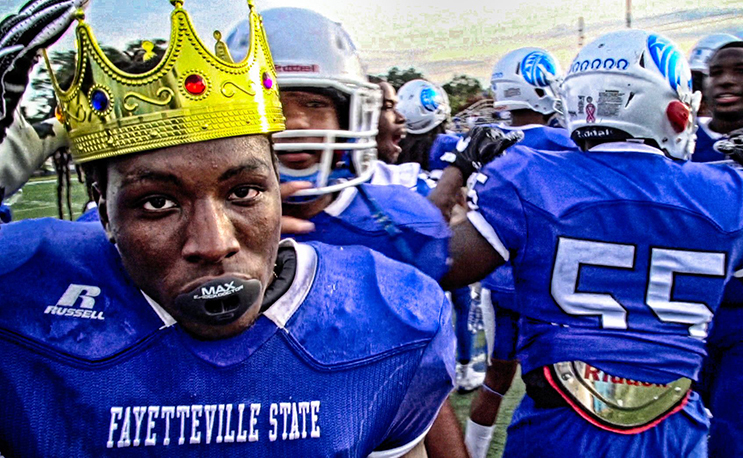 Fayetteville State will travel to Salisbury to face Livingstone next weekend for the Blue Bears Homecoming. Winston-Salem State defeated LC 42-14 to drop the Blue Bears to 0-8 overall and 0-5 in conference play.